Here’s who was in attendance: (board members): Ken Jones, Scooterfish, Big Rich, SteveO, Mjonesjr., Salty Nick, West Coast Dave, Ranger76, Mr Tuna, Dave Mush, CrstLuv, Stinkyfingers, DolphinRider, Jimmythekid, Rockfish, AbeV.Perry, Rock Hopper, Oregon Green, Sinker, PierHead, Skinner, Ben, Baitfish, RosterQueen, MartyMart, Lucy, Prometheus, Snakeman70, Songslinger, Gyozadude, R4616, Redfish, Blackmarlin, Marv, EdTam, Wildmoose, Nufo (but several others came late and did not register – KJ). Subject: And the winners are… (1) MartyMart with the biggest bat ray going 55-lbs and 42″— (2) Rockfish with the most (6 bat rays) — Each took home enough to get themselves a nice new rod or reel. Nufo: 1 ray 16-lbs 28″; Mjonesjr: 1 ray 16-lbs 28″; Jim D.: 1 ray 27-lbs 34″; West Coast Dave: 4 rays—34-lbs 37″, 28-lbs 34.5″, 12-lbs 25.5″, 15-lbs 27″; Stinkyfingers: 1 ray 10-lbs 26″; Dolphinrider: 1 ray 12-lbs 27″; Rockfish: 6 rays—5-lbs 22.5″, 10-lbs 26.5″, 18.5-lbs 26.5″, 20-lbs 31″, 24-lbs 32.5″, 27-lb 32.5″; OregonGreen: 1 ray 10-lbs 26″; Ben: 5 rays—37-lbs 37.5″, 7-lbs 33.25″, 17-lbs 29.5″, 16-lbs 28″, 21-lbs 33″; MartyMart: 2 rays—14-lbs 28″, 55-lbs 42″; Prometheus: 2 rays—10-lbs ?”, 13-lbs 27″; Redfish: 2 rays—19-lbs 37.5″, 5-lbs 18″; Songslinger: 2 rays—4-lbs 20″, 8-lbs 21″. Total of 29 rays. For those who aren’t familiar with the pier, it’s a good 3,000 feet long, maybe a little more than that (according to my navigation chart of the bay). That’s over TEN football fields long! 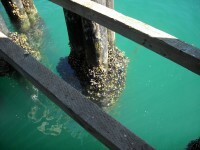 The original pier was made of wood and was much longer, extending approximately 13,500 feet into the bay. The ruins of the old pier are still there, and between the end of the new pier and the ruins of the old one is a fairly narrow passageway for boats to get through, so that they don’t have to go clear around the end of the ruins. 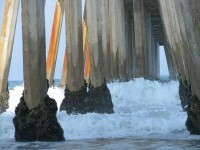 Across the end of the new pier is a wooden barricade about ten feet high. People call this a “windbreak,” but it’s not; it’s actually just a barrier to prevent people casting lines into the boat passageway. (A real windbreak wouldn’t have two- to three-inch gaps between the boards!) What’s all that got to do with anything? 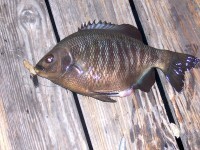 Well, at one point, Redfish, who was fishing on the south side of the pier next to the barrier, hooked a ray. 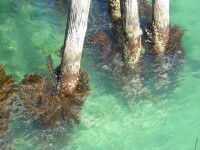 The ray didn’t want to be caught, so it headed north, around the end of the pier– which meant that Redfish either had to break it off or climb up ONTO the barricade. Being both determined and very agile, he did the latter—and then Stinkyfingers and Scooterfish climbed up there too, with a crab net! For several minutes, they struggled to try to land the ray from the TOP of the barricade, while the rest of us stood there in awe of their bravery and hoped none of them would fall into the drink. 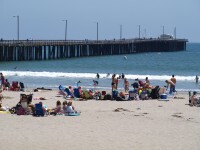 Finally, they were able to work the ray around the end of the pier and land it from the north side. I really WISH I’d had a video camera—that was a hell of a show! I did get some pictures and will post them when I get them developed. It was a fairly clear evening, and so we had an excellent view of the fireworks show, impeded only slightly by Yerba Buena Island. The weather had been nice and warm during the day, but it started to chill down in late afternoon, and by the time the derby started, it was chilly and windy. As the evening went on, it got chillier and chillier, and there was ALWAYS wind—sometimes strong, sometimes dropping to a mild (but cold) breeze, but always there. Wind, wind, wind! The people from So-Cal found out what I was talking about when I posted that warning! 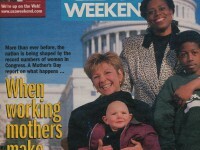 Fortunately, they had heeded it and were well prepared with plenty of layers. At one point, I dug out the Space Blanket I’d brought along and sat down on the pier huddled up in it to try to get warm—and wonder of wonders, it actually works as advertised! The blanket totally blocks the wind, and the Mylar lining reflects your body heat back to you, so that you can actually get warm even though you’re already chilled AND are sitting in the wind. Now, a big hats-off and thank-you to BigRich. He bought plastic tarps and tied them over the barricade, so that it actually served as a windbreak. He also brought a barbecue grill, water for coffee or hot chocolate, and hot links, and he spent much of the evening cooking hot links and brewing fresh coffee. Thanks to him, people could get out of the wind, warm their hands over the barbecue, refuel themselves with a spicy hot link, and revive their energies with a cup of coffee. His efforts and thoughtfulness were much appreciated, so THANK YOU, BIGRICH!!!!! Also, a big thank-you to PierHead and Sinker, who brought a whopping supply of their “People’s Bait” and provided anyone who wanted it with salted anchovies and sardines. By the way, that pier cart they’ve got is something else—and of course, I stupidly forgot to take a picture of it. Also, a thank-you to Baitfish (Adam), who really does have a singular talent for untangling bird’s-nests. Right at the end, I had given up on catching anything and was just casting for practice. I hadn’t had a bird’s nest all evening, but finally I got one. I struggled with it for a while, with no success, and then Baitfish came over and offered to help. It was amazing: he pulled a bit here, tugged a bit there, and presto! I told him he should give lessons! Also, a thank-you to Gyozadude, who gave me a ride home, and another thank-you to each of those who offered to do so. Finally, a BIG thank-you and a standing ovation to Nufo, for coming up with a great idea and turning it into a reality, and to those who helped him with the process. It was a smashing good job! And of course, another BIG thank-you to Ken Jones, for obvious reasons! We hear so much about all the bad people in the world—the criminals, the crooks, the dishonest politicians (is there any other kind? ), the greedy, the scumbags and wretches who make it their life’s work to cause problems for others—that it’s easy to forget that there are many, many GOOD people in the world. Get-togethers like this one are a great reminder of that fact. One example: Wild Moose, who had read my message about my Wednesday evening casting practice, when the wind came up and my hands got cold, actually brought a pair of gloves to give to me in case I didn’t have any! Can you believe that? I was just floored. A great group of people, a great evening, and I’m SO glad I went! I’m going to shut up now, before this turns into a book! 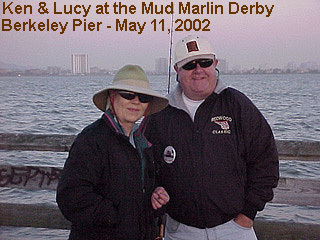 The wise sage who said it’s the fishin’, not the catchin’, that makes fishing special could not have been more right, at least when it came to the Mud Marlin Tournament, 2002 version, that took place last night at the Berkeley Pier. I, for one, never even rigged up the rods and reels I had brought to the affair. 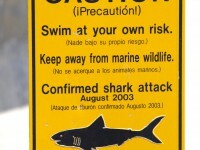 Nor did I lob out any special concoction in hopes of attracting those mystery sharks and cute little rays (little?). I didn’t even give thought to providing the crabs food for their larder. 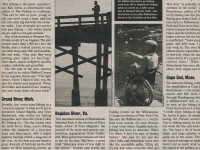 What made it special was the assemblage of the “pier rats”—the Pier Rat Nation so to speak, and a friendlier, more diverse, more helpful, more benevolent, more conservation minded group of anglers would be hard to find. And, not to forget, well educated and literate. The contrast with the stereotypical image of pier anglers as a slovenly, take-‘em-all, ill kept and not-too-friendly group (or booboisie) was somewhat mind-boggling. Yes, fish were caught! 29 mud marlins (bat rays) were officially entered into the derby sheets but a plethora of sharks—brown smoothhounds, leopards and spiny dogfish—were also taken. 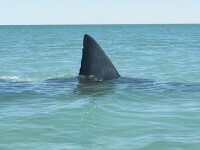 However, the sharks were not eligible for the prizes. And although a couple of little batties were caught (do I hear the names Songslinger and Stinkyfinger anywhere) several in the 40 and 50 pound range were also included. Nothing huge but some nice fish. And some were lost, perhaps even bigger fish than the winner, but we’ll never know for sure. 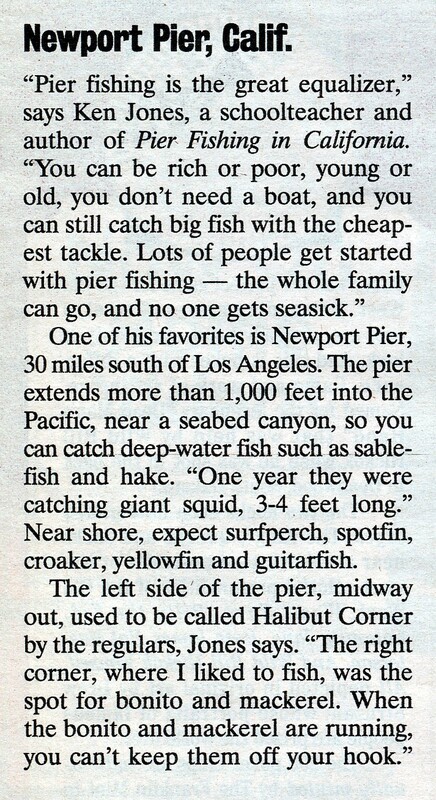 Personally, the fish were secondary in nature to the pier rats themselves and the evening out on the end of the old ferry pier, one of the bay’s premier observation points to view San Francisco, nature’s ever-changing weather patterns, and man-made intrusions, some positive, some negative. The weather: The evening went from sunny, cool and windy, to dark, cold and windier (did someone really say it was bracing?). Everyone was prepared for the weather condition but still expected and hoped that the wind would subside by 9-10 P.M.; it didn’t really happen although the wind wasn’t too bad. Sights: A pretty sunset, followed by the usual beautiful view of The City, followed in turn by a spectacular fireworks show from KFOG over in San Francisco (and no fog to block the spectrum of colors dancing over the skyline). And not to forget the flotilla of boats, yachts, bathtubs (not really) etc. that headed over from Berkeley to witness the fireworks up close, and then returned in a maelstrom of Indy-like speeds back to their home port—all via the narrow inlet at the end of the pier. Umpteen cries of “watch the lines” followed by “thank you” as (most) boats moved away from the pier. More than a few lookie loos’ out on the pier for a view of the fireworks, a few dressed-for-the-prom young men and women (and how refreshing to see one well dressed young man take off his coat and give it to his date before they began the half mile or more chilly trek back to their car). Pier Rats: As mentioned, more than wanting to fish, I wanted to meet the group. So many names on the Message Board over so many months (and years) and yet I had met only a few before this night. The Derby would allow me to make some connections and provide a little visual reality to round out the pictures. Unfortunately I did not keep a list of all the people I met—unlike the list of fish I catch. I should have done it. Over 40 people showed up with around 35 or so actually fishing. Every one of them I met was friendly and having a good time. Herein are some mental notes I made—and I apologize in advance because I know I will leave out some worthy names. Nufo—organizer par excellence. Keeper of the list, money and measurements. Good guy and job well done. Dave Mush—as soon as a fish was landed (and sometimes before) here came Nufo and Dave to weigh and measure the batties. Great job. Big Rich—always there to offer a hot cup of Joe, hot chocolate, some delicious sausages and friendship—what more do you need. Scooterfish—all the way out from New Orleans and a finer fishermen would be hard to find. Obviously knew the ins and outs of the Berkeley fishing scene and would make a great fishing guide (so go for it Scooter). Stinkyfinger and Dolphinrider—their usual charming and effervescent selves. 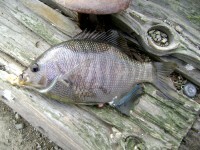 Songslinger—he fished a little inshore of the others but nonetheless managed his fish—as usual. Redfish—a Berkeley “regular” who knows the spots and techniques and showed everyone how to truly walk the end of the pier. Mike Jones Jr.—same name as my son and a Message Board contributor when the Message Board was still in its infancy. Glad to finally meet you. Black Marlin—now you’ve finally promised me that autobiography. Lucy—we finally met and I find her as charming a lady as I expected. Now we’ve got to help her get some of those big monsters. Wildmoose—showed up with his fly rod but the wind was too strong on this night. 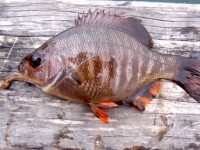 However, he had hooked up several batties in the morning while fishing the South Bay flats. What a great way to fight these marvelous creatures. Our SoCal contingent—PierHead, Sinker, Baitfish and RoosterQueen and SteveO—as knowledgeable and helpful a group of anglers as you could meet, experienced “a different” kind of angling (and, dare say, different weather conditions). Absolutely great people. By the way, PierHead and Sinker drove all night up from Santa Barbara and then met Stan at 5 in the morning when they headed over to Strawberry Point in Marin County to fish for some bat rays. Landed five I believe before continuing on to the bat ray tournament. When they left at 1 am they were a very, very tired duo. Just hope the drive back down was uneventful (as in little or no sleep in two days can be dangerous). Baitfish and RoosterQueen on the other hand were staying in a motel in Oakland and hoping for some striped bass action—somewhere. Did it happen? West Coast Dave—Not a bad night, both quantity and quality fish. Good job. Gyozadude—Not a great night fishing for Gdude but he was as full of wit and wisdom as always. Marty Mart—congratulations on your derby winning 55-pound mud marlin. Rockfish—Wow, six rays for the evening. The squid stuffed with anchovies and sardines were evidently the main course for the evening. Prometheus, Skinner, Ben, Rock Hopper, CrstLuv, Rockfish, AbeV.Perry. Oregon Green, Skinner, Ben, Snakeman70, R4616, Marv, EdTam, MartyMart, Salty Nick, Ranger 76, Mr. Tuna—thanks for the opportunity to meet all of you and to experience the pleasure of your company. Fishing Results: 29 bat rays weighed and measured, one more landed before the official starting time, and at least 6-8 lost to the piling. Many brown smoothhound sharks, at least one leopard sharks and a 40+-inch spiny dogfish. An impressive toll of fish for the evening but Berkeley regulars know that the results could have been even better—both more fish and at least a few bigger fish. Only negative notes: (1) Stupid people (none of ours I am sure) who trashed the bathroom. 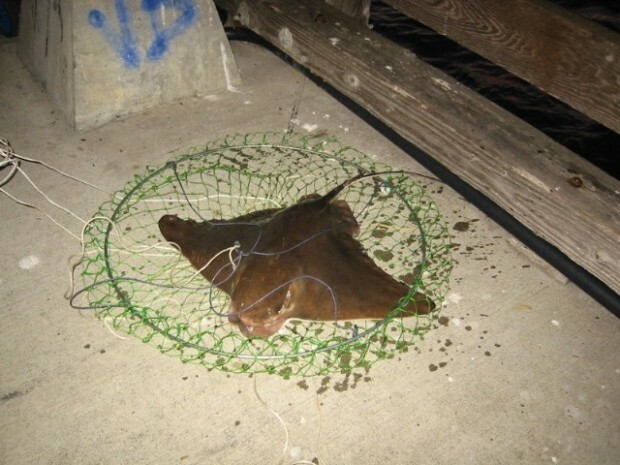 (2) One angler who got stuck by the stinger of a bat ray. It was painful and although the group dressed up the wound as good as possible you’ve got to be careful that stingray wounds do not become infected. Be careful when handling these fish. Some of you have thanked me for the book and the site. I prefer to thank you for the friendliness you showed last night and the job you do in your daily visits to the piers and shoreline areas. You’re an elite group and your actions show people that “pier rats” are indeed a proud and noble group. 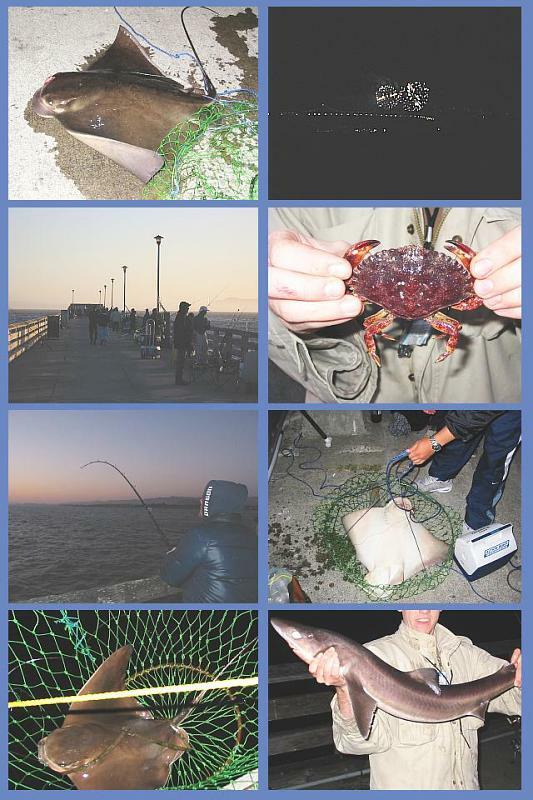 Posted in Pierfishing, Saltwater Fishing and tagged with Berkeley Pier, California piers, Mud Marlin Derby, Pier Fishing in California, pierfishing, saltwater fish, saltwater fishing. RSS 2.0 feed.